Re: [MasterNodes VIP CLUB] Start Earning Passive INCOME With CryptoCurrency Masternodes. Do you have a telegram account where I can add you and chat for some questions? Yes I have. PM'ing you, check it. I PM'ed in Telegram. Please reply. I still have not received a reply. I also can't send a PM here on WF, the limit of the messages that I can send has been reached. FYI - u know u can always delete old messages to free up more space to receive new ones. Seats are cheap, $50-$100, so it's perfect opportunity to start investing and start receiving rewards. Last edited on 27th Jun 2018 at 12:11 AM. Looking to jump on board soon. Just gathering the funds at the moment. How much would we have had to invest in seats to get the return on the examples above (Pure and Polis)? Also, is there a minimum and maximum for purchasing seats? I live in California (PST), when is the deadline to buy seats to receive payments (coins)? Each currency masternode is different and gives different ROI. Some MN ROI is in 30 days, some in 160 days. The ones which ROI is longer are more stable and the coin is more trusted. For example DASH MN ROI is in about 5000 days, but coin is super trusted and super strong. Masternodes which ROI is like in 30 days, price of the coin can drop or can increase,no one knows. Best is to invest into many different currency masternodes so you would diversity. You see, you can invest $100 into MN which ROI is 30 days. But the price could drop and from 30 days it become 45 days. But its still paying you each and every day. But the price for the same coin could increase 10x and you will make killing. If you invest into coin which ROI is 120 days, the price also could decrease or increase, like bitcoin or ethereum, but you will get rewards/coins for masternode each and every day. You cant predict the future of the coin price, but you are 100% sure that if you own MN you will get coins each and every day. this is the beauty of masternodes. We are announcing new currency masternodes each week, so you have full week to buy some particular masternode seats, next week I announce new one and you again have one week to buy as many seats as you want. We are trying to offer seats which cost $50-$200 and the ROI is i about 60 days, but if we see nice and good masternode which ROI is in 180 days, we start building them and offering seats for people. Sometimes ROI is in 200 days, sometimes in 30 days. What you need to do is to just buy seats, increse your seat numbers so you will get more and more coins each week and also you would diversity. Diversity is the key, more different MN seats you have, more stable income you will get. There aren't ANY business in the world which pays you passive income like Masternodes and the ROI is really fast compared to other business. Re: [MasterNodes VIP CLUB] Start With CryptoCurrency Masternodes. I've been in the crypto space for a couple of years now and am not new to concept of masternodes. There are two things that are true about MNs. 1) they can be very lurcrative. 2) they can be very expensive. What he's done here is essentially removed the hefty price tag from these and lowered the barrier of entry so that almost anyone can take advantage of this amazing revenue stream. disclaimer - I have not purchased this (yet), but have worked with him on a few other projects and he is extremely reliable, honest and trustworthy. I'll be jumping aboard soon and a advise you all do the same. You won't find a better deal or way to make passive income anywhere. why cant we just use a shared masternode service where we dont even have to pay any expensive fee except for the service fee which is normally 5% and the coins? also, there are a lot of scam coins. so how can you guarantee daily or weekly returns when a coin can turn out to be scam and become worthless? After joining, you not getting just opportunity to invest into masternodes, but you also receive my full attention, support and help ! Also I am planning to expand this group and offer not only MN, but trading lessons, signals and other stuff, so you are like VIP customers who will be getting everything what I will release in the future. Yes, there are a lot of scams coins, it's correct, but we are doing a research on every coin which we doing masternodes on, we trying to spot the scam ones and do MN only on good ones. Of course price can decrease, but it also can increase, we can't predict what price will be in the future. We can predict what the price will be for bitcoin or eth too. What you need to do is to diversity, to buy more different MN seats, so one MN price decrease, but another increase, this is how you diversity and getting pretty stable earnings. is there any way to join your club without paying $497 if i dont want any MN but just want extra information? if one wants to make $1000 a month, how much would be the total cost? Mate, this offer is for masternodes, It's an opportunity to receive good support, help and you would have the ability to get into MN cheaply. Right now, its only for MN, in the future I will expand to other income streams like trading,ICO's, but not NOW. So everybody have same rules and same price for access, sorry. There are two ways to start making $1000/month. First is to start making such amount in your first month and second way is to start earning such amount after 6 or after a year. If you want to start earning $1000 monthly right away, you would need to invest about $2000, because ROI is in about 60 days. But you can invest $100 and keep receiving weekly coins and reinvest. So in this way you could start making $1000 monthly with only $100, but after more time. if i decide to invest $2000 so that i can get $1000 a month, will i still need to choose any coin myself or i just give you $2000 and you do the rest in the background and my expectation would be just to earn $1000 a month? instead of sending me coins, can you send actual money to my paypal weekly until i get $1000 from you during the month? There are always 1-3 currency masternode seats available all the time, ones are more expensive, others are cheaper, depends on ROI, how strong coin is and stable and so on. I always tell people to research first before investing, but we trying to offer only good currency MN's. What I suggest is to diversity. It's the key to stable income. You should invest into as many different MN as possible, like 5 or 10 different MN seats.This way if some coin price drops and some increase, your profits will be stable. If you decide to join, I would explain and help with everything, no worries, so you could easily reach your desired income level. We can work out about sending paypal instead of actual coins, no worries. One more thing, as I said before, for entry fee which is $497, I accept only cryptocurrency such as BTC, ETH, no paypal. New Masternodes this week ! JOIN NOW, longer you wait, more amazing MN's you miss. Join NOW and start making HUGE profits ! Last edited on 27th Jun 2018 at 12:12 AM. Masternodes sounds like something from a sci-fi movie but I was intrigued, so I jumped on board as I love crypto. Everything so far is really smooth. I had lots of initial questions which were answered pretty quickly. So far I am happy I joined as I like the way everything is presented, which is in a very professional way. Obviously it's too early to tell if this will make me rich but so far it seems like a great way to make passive income, I might even up my stake. This week new Masternode ! AEG coin. and its not just 1 or 2 coins. there are a LOT of coins that start as good and then become worthless. Yes you are correct. There are so much scam coins, which disappears after few days,weeks or months. This is why we doing deep research on coins which we doing masternodes. After hundreds of masternodes, we have never saw any scam coin, because we do research and check the team, check project and so on. So we are offering only good masternodes. Yes, the price could drop from $0.1 to $0.001 per coin and later increase again. Or the coin could increase from $0.1 to $10, who knows. We even don't know the price of bitcoin or ethereum in one month or one year, no one knows. What we doing is selecting good coins with good project and team and start building masternodes. We start doing new masternodes each week, and we offering seats for masternodes very cheaply($50-$200). Some coins price decrease, some increase, the key for steady and increasing profit is deveristy, to buy more different coin masternodes seats. If you do this, you will definitely catch some masternodes which will be huge and will give you passive income month after month, year after year. This week new MASTERNODES ! GIN and ULTRA coins ! ONLY for this week, I am giving 50% discount for new members ! So the price is not $497, but ONLY $249 ! PM about this DISCOUNT details! Re: [MasterNodes VIP CLUB] Passive INCOME With MN! 50% Discount ! Also a question - can we reinvest the coins earned through the MNs? PM sent. Check it ! You can't reinvest into the same coin, because masternode seats are offered for 1-2 weeks, after this period current MN seats are closed and new MN coins seats are opened. This is done because to force people to diversity, because diversification is key to have steady and growing profits in masternode business After you got your payouts, you can sell for btc and join/buy new masternode seats. can you pm me about the 50% discount and how do i get in? One more question - for buying a seat in any MN, we would have to send you BTC/ETH? For seats you would need to send same currency coin which currency masternode is. For example, if you want to get DEV coin masternode seats, you would need to send me DEV coins, if AEG coin Masternode,you need to send AEG coins. Each masternode seat requires minimum amount of coins, it can be 50 or 200 coins, but we are trying that each seat would cost $50-$200. That could present a challenge, as it would mean setting up accounts with new exchanges that carry the new coins, and then buy the coin from there - all within a week (when you introduce a new MN). These exchanges tend to be very slow in approving new accounts. How do we tackle this? Almost all masternode coins are on the same exchanger and it takes few hours to deposit btc, buy required coins and withdraw them, trust me its very easy and fast. You don't need to verify your identity or something like what, you just need to verify email address and you are ready to go and buy any coins. Guys, the discount will be available till next monday, so hurry to grab discounted access to my VIP club before it's too late! Please DM me your skype. I am very interested. I'm ready to jump on board. Please PM me the details on how to get started. Thanks for offering the 50% discount. Alright, check your PM ! I am very interested, however I have seen no proof that anyone has received weekly payments from you, and this offer has been running for a few months now. Have you got any proof please? I'm in. Sounds like a great service. Will be posting here once I start receiving payouts. First of all, people haven't joined right away after this offer went live, it took few days or week to get first client/customer. Also, I received many PM's and messages requesting and asking to offer discount for this offer longer, so I decided to offer 50% discount a bit longer, so guys, jump in while this discount is available ! Thanks for your reply. Please pm me more info. I joined naviown's cryptocurrency masternode club a few weeks ago and I just received my very first payment of $140 on Paypal. I just bought a total of five different coins on five masternodes. I received the payment for two different coins today. I will get the payment for the five coins next week. I will buy more coins as the weeks and months progress because diversity is key. For folks interested in passive income: Take that leap of faith and start investing in masternodes. 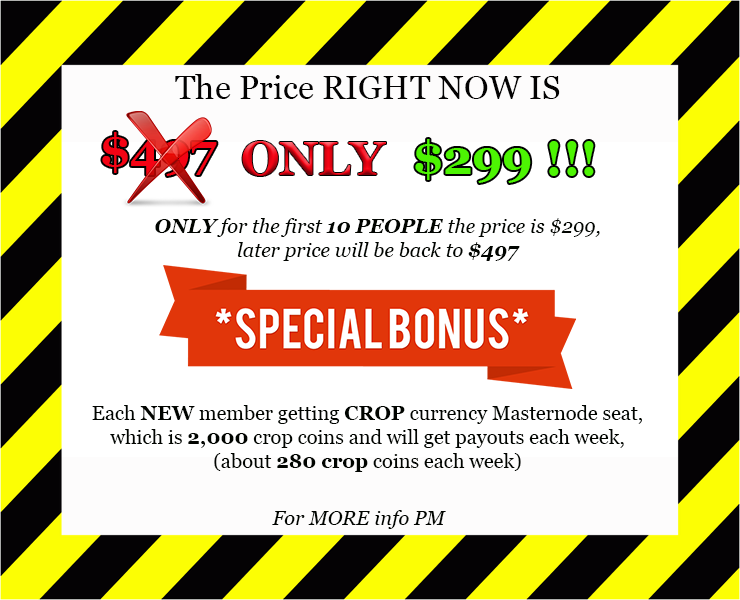 For MORE information about BONUS CROP masternode, about prices and other info, please PM! Last edited on 26th Jun 2018 at 04:53 AM. I've sent you a message on Skype. I know it is now the weekend, but I had a few questions. If we have already purchased the WSO, can we still get payments into our Paypal with this new offer? Haven't heard anything since I purchased last week. I don't know when the new Seats are available? What coins to purchase? How much? You bumped the thread with a new offer, and are not answering any questions? Re: [CryptoCurrency MASTERNODES] $100/Day EASILY Achievable. HUGE Discount.Reviews! Please PM/Skype - I have a few questions. Interested in learning more.